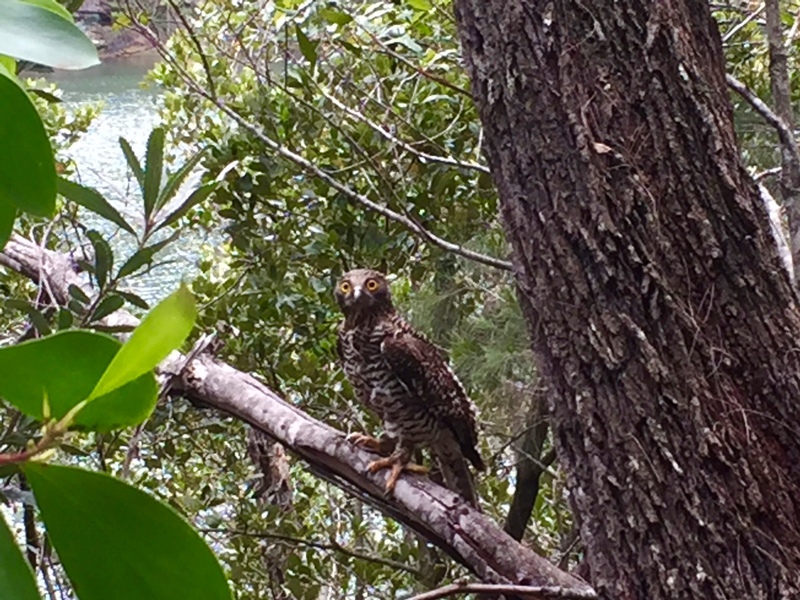 Recently, I was fortunate to observe a magnificent looking ‘Powerful Owl’ whilst walking the Warimoo and Sphinx Tracks at Bobbin Head, in Ku-ring-gai Chase National Park. Janet and I think of this area as our ‘backyard’ and over many years we have walked and kayaked through this area, which is little more than 20-kilometres north of the Sydney CBD. And yet, this was a first time spotting for us of the powerful owl, which is Australia’s largest, in this location. Following my sighting of the bird last week I made contact with Beth Mott, Project Officer for the Powerful Owl Project with Birdlife Australia who was excited to review the area and to glean if there is a pair that might be raising a young chick. So today, Janet, myself and Beth set off along the track to see if we could find any further signs of inhabitation. Janet and I were on a steep learning curve when it came to bird observation, but Beth, who holds a Degree in Conservation Biology, and who has undertaken a PhD study on ‘Animal Community Dynamics’, enthusiastically showed us many of the ‘telltale’ signs to look for. Um, that includes bird vomit and droppings, you know, poo! “We aim to locate Powerful Owl breeding pairs within urban Greater Sydney, which also includes Newcastle in the north to Kiama in the south and west to the Blue Mountains. We also aim to identify the location of nesting trees and record breeding behaviour and success. We were surprised to learn that there is estimated to be only around 400 Powerful Owls in the Greater Sydney Region and around 5,000 in Australia, and that puts them only one notch above being an “endangered species”. Photos: Baz – The Landy, Ku-ring-gai Chase National Park, Bobbin Head. It’s so interesting to read about the wildlife in Australia. Thanks for the lesson on a bird that I’d never heard about before. All the owl calls I’ve heard here in the north have always happened at night. That is one beautiful owl. Looks a bit like our Great Horned Owl, minus the “horns”. Those are some powerful feet! My thoughts exactly. I here them at the cottage all the time but I’ve never been lucky enough to see one. My cottage is on Christian Island in Georgian Bay in Ontario, Canada. Nice one; look at those feet!!! Crikey, you wouldn’t want to tangle with those talons, hey…!